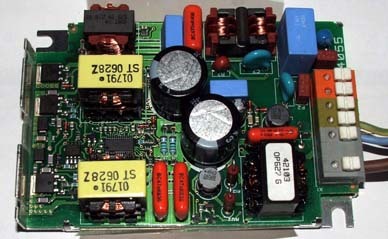 The unit is not particularly efficient and could be improved by reducing the output voltage. 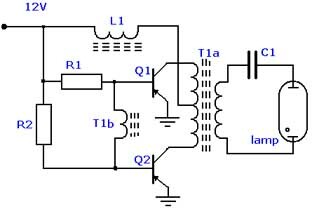 This is possible by reducing the number of turns on the transformer's secondary coil and an additional ignitor circuit across the lamp. Image 2 shows the transformer construction. 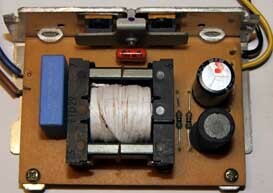 Two 'E' shaped ferrite cores are inserted either side of the windings on a plastic bobbin. 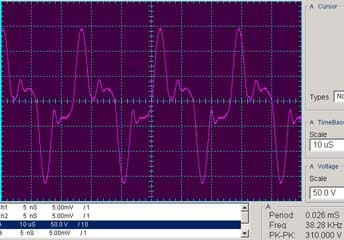 The oscilloscope trace in Figure 2 shows the inverter oscillating at 38Khz with a peak to peak output of 310V for a 1V input. With a 10V supply the peak to peak output may be over 3kV. The circuit seems happy to run with an input current of 3 - 4 A making its maximum safe wattage around 40W. A commercial electronic ballast to run a 70W metal halide lamp from the mains is shown below in image 4.